Nick DiGangi is a proper New Englander and an affinity for heavily hopped ales and ’cross. Last year, Nick DiGangi, a proper New Englander with an affinity for heavily hopped ales and ’cross, offered some of his reflections on a new season of racing. After missing 2012 ’cross season due to injury, he approached 2013 with an open mind shares his thoughts (along with his buddy Seth Lincoln) over at Not Quite Belgian. Some of us only have gravel racing on the mind, which is understandable with Rouge Roubaix hitting off the season and Barry Roubaix just around the corner. But this is also the perfect time to reflect on what was learned with a full season of cyclocross. (Update: It also looks like DiGangi has since found some success with Singlespeed Cyclocross over the 2014-15 season). ’Cross season is over and it seemed like time to put down my thoughts on what I learned in my inaugural season. I think there could be more information out there for first season/average joe ’crossers and I hope this article helps you out. For more, check out Cyclocross Magazine’s training and newbie section! And if you want a European pro’s best tips, check out this Bart Wellens spoof. PIT IS LEGIT – It might seem obvious but know the rules, and if you can, have a bike waiting for you. 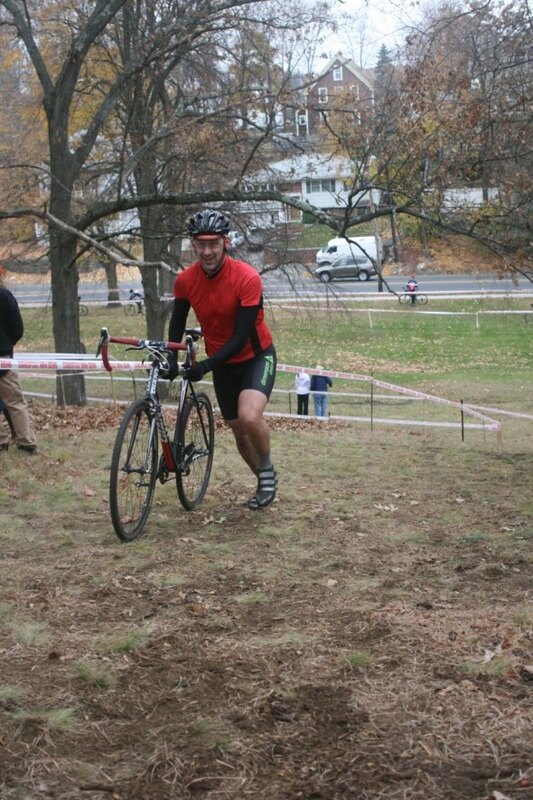 I thought I knew what I was doing, but then I flatted at the Gloucester GP race and finished way back without pitting. My mistake, won’t happen again. WARM UP – Another obvious one but it’s important enough to mention. Make sure your engine is primed and ready to go and make sure you get in a couple warm up laps in the course. If your race is later in the day, watch an earlier race, see what works and what doesn’t. People taking a turn too wide? Plan on taking the inside. People washing out? Scrub your speed. Warm up is a great time for course recon. PACE – Test your limits. Sacrifice a race on your calendar to go out and take it to your physical limit. It’s not fun but it will help you throughout the season once you have a reasonably good idea of how far you can push yourself. CORNERING – A quick Google search will yield the following results: “Look where you want to go, keep your weight back” (and so forth). All very true, but something I don’t see mentioned is confidence. Be confident! If you think you are going to fall… then you definitely will. Carve the course with confidence and don’t be scared to fall. I was amazed at how fast I could take some corners, especially during warm ups. Addendum: However, don’t be too confident. You need to stay sharp, since as laps wear on, it’s easy to get lazy – either mentally or physically. Some mistakes I made were last lap blunders that could’ve been avoided. Losing five seconds here or there adds up real fast and could be the difference between being lapped and making the cut. EAVESDROP – Listen to what people are saying. Be nosy. If everyone is worried about riding a certain section then prepare to run it. If people are talking about running a section and you know you can ride it, then do it. Anything to get an advantage. It will also give you a sneak peak into how your competitors are feeling. Starting points – I always line up on the outside, the middle is where all the congestion is. Most holeshots will start with a straight-away into a left/right hand turn. I made sure I lined so I would be on the outside line of the first turn. While it might be a wider line, everyone will be taking the inside line, and your chances of getting pinched and caught up in a bottleneck are huge. If you get bottlenecked, don’t panic, save your energy and slowly work your way back up. It’s worse to panic and go harder than you would in the opening hole shot only to burn out half a lap later. RACE LIKE A ROADIE (for now) – Gain time on the straights, lose it in the corners. So if you can pass someone, do it! The technical stuff will improve over time and when it does you can adjust your strategy. Until then, though, if you see a chance to overtake someone on a straight, go crazy and take it. GET MENTAL – Zonked? Bonked? Shellacked? Knackered? We all know the feeling, and whatever you call it, we all get tired, and if you are tired, chances are the guy next to you is too. Sometimes it’s good to give a little dig to scare people off. Quick example: During the last lap of one of my races, I was about to get passed. I was feeling really gassed and we were approaching an incline, but rather than give in, I stood up and stomped up the hill. To my surprise, the guy behind me gave up and sat in. I was able to ride away and hold him off to the finish. RIDE LIKE A PRO – A lot of times we feel like we need to stay on the bike for as long as possible and ride every section we can. While it is true staying on the bike can be faster, sometimes it’s faster to get off and run a section. Pro = Fast, if it’s faster to get off an run a section, then do it. SNOW RIDE (take it easy) – With my final race taking place in the snow, I was on a hunt for any tips I could get. I was completely let down with the lack of information out there. Yes, I know it’s going to be cold, yes, I know I should probably bundle up… But what about riding technique? So I took to the Cyclocross Magazine forums for some advice, and boy did they deliver. The forums had great info for all who are facing the snow. Then again, New Englanders are more than familiar with the most recent winter storm. I raced in Connecticut where they got more rain than we did up in Massachusetts and as a result there was about 5-6 inches of wet sloppy slush for me to race in. Everything went out the window. What did I learn? I need more sustainable power. Muscular endurance. The slop just sucked the life out of me. Unfortunately the course ended up looking great for the later races, but when you’re racing bright and early you don’t get those benefits. HAVE FUN – Probably the most important thing. Listen…You will come in last. Come to terms with it, because it’s going to happen. But I’d like to share a story: I happened to park next to the guy who won the 4/5 race. Post-race while I was packing up, he was there chatting it up with the guy who came in second talking about the field and how at least 20 of the riders should have been/were Cat 3 guys. So the moral of the story is: You aren’t as bad as you think. That’s all folks! I can’t believe the season is over already. If I could do anything differently, I would’ve prepared a little better. I thought I knew—but I didn’t. More time doing drills and more time doing bigger heavier efforts would have helped. This entire year was a great learning experience and I can’t wait to put it all together next year! Thanks for the advice. I’ve found from mountain biking experience that I am usually much faster in the corners and in technical sections that in the flats where I just don’t have the power. Climbing power is good, just not in the flats seated. More road miles for me. I would also add try not break until absolutely necessary. Goes without saying, right, but being confident at speed and choosing the right line to minimize breaking conserves momentum and energy.